As BCUI is based on MDF, please ensure that Generic object permissions are also enabled. 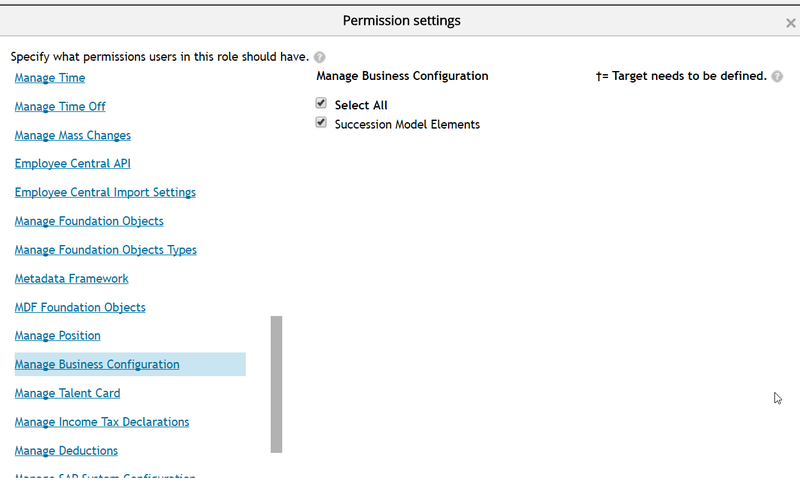 Once BCUI is enabled it can be started from the Admin Tools-> Company Settings -> Manage Business Configuration. BCUI allow you to make changes in an easy manner for most of the settings for the Succession Data Model and Country specific SDM. Apart from SDM, BCUI is the only tool by which you can maintain data model for different Person Types for example Dependent or Contingent Worker. Optimistic locking: Optimistic locking will ensure that no two users can make change to the BCUI at the same time. Background elements: It is now possible to configure background elements directly in BCUI. Tab Elements: Tab Elements support is now added into BCUI and could be under the Employee profile section. Audit data: Each change in BCUI will also create an audit data, though we have no UI as of now to see the audit changes, but this change will be foundation for developing an audit feature for changes in data model. Miscellaneous changes: Apart from the changes above we have now added support for element permission and added some more validation to ensure the consistency in data model. In next couple of releases, we are planning to achieve the functional completeness for BCUI, thus providing both consultants and customer single UI to maintain SDM and CSF-SDM in a simple manner. Please feel free to provide your feedback in the comment section.